Wound care in pharmacy is extremely important as pharmacists are often the touch point of health care interaction for individuals requiring assistance in this area. Currently, a wide variety of over the counter products are available for the treatment of minor wounds and burns, including topical antibiotics, wound irrigants, wound antiseptics, various types of tapes and bandages, and products that aid in reducing the appearance of scars. Pharmacists are uniquely positioned to guide patients on the proper selection of these products, as well as to gauge the appropriateness of self- care and direct patients to seek medical attention when warranted. In healthy individuals, minor wounds usually heal within days or several weeks. However, certain chronic illnesses (diabetes, heart disease, rheumatoid arthritis) and aging make the skin more vulnerable and slower to repair. In these patients, wound healing can be a complex process requiring specialized wound dressings to augment the body's natural healing process and provide an optimal healing environment. Although dressing selection is typically decided by medical staff, pharmacists can have a significant impact on patient care by being knowledgeable about potential drug interactions and identifying factors that contribute to delayed wound healing. 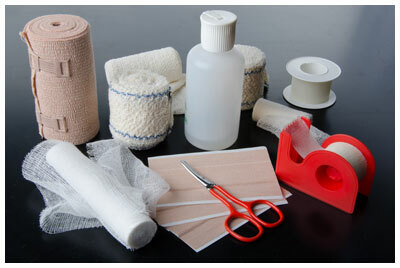 Marketing a wound care service is very important. Physicians, hospitals, and wound care clinics can all be excellent sources of referral and serve to develop this transitions of care opportunity. Clearly, it is important to carry or have access to the products that physicians are recommending and patients need. In addition to the companies listed below, talk to your wholesaler about their wound care line.